Old Skool Cafe is a one-of-a-kind youth-run supper club. We train and employ at-risk youth, ages 16-22, to run all aspects of the business. 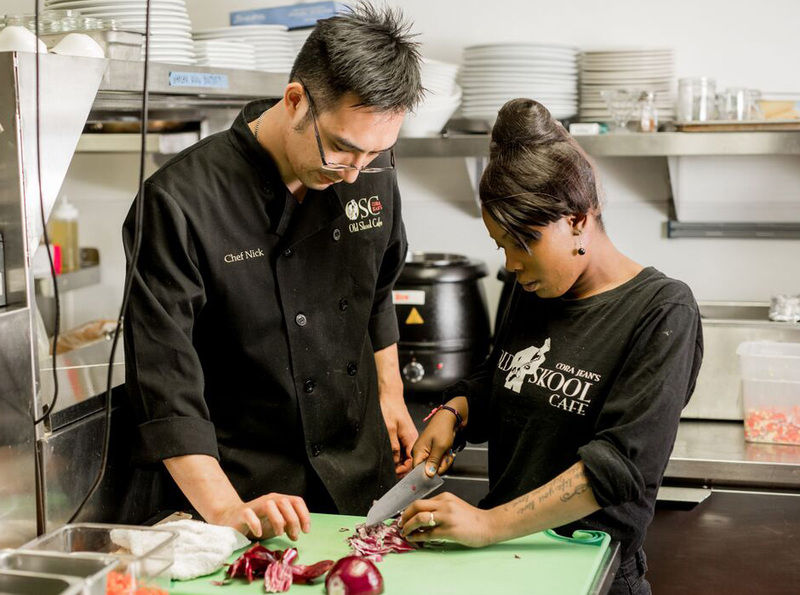 Learning to be hosts, servers, chefs and entertainers, we offer youth a solution for addressing their basic needs and break the cycle of poverty and incarceration. We provide a supportive environment to help youth maintain employment and be successful in all aspects of their lives. Three major phases for youth working at Old Skool Cafe. A 12 week (20 hours per week) intensive restaurant and skills training program providing comprehensive information to set youth up for long-term success in the marketplace. This program is free, trainees are paid for successfully completing the program. After restaurant trainees successfully complete the 12 week training program, they are encouraged to apply for employment during the second phase of the training program at Old Skool Cafe. In the third phase of the employment program youth build leadership and management skills. Every Saturday Old Skool Cafe offers an informational session and an opportunity to enroll in our program. To attend or receive more information, please fill out the form below. If you'd like to apply to our program, please click the button below. It truly takes a village to help our youth move from merely surviving to thriving with a second chance at life. Partnership and collaboration with local companies, nonprofit organizations and restaurant industry partners are crucial for the success of our youth. While we are still growing our sustainable revenue base, we rely on our foundation, corporate and private donor partners and sponsors. Some of our funding partners include the San Francisco Foundation, Bothin Foundation and DCYF. With a thriving and vibrant restaurant scene in San Francisco, our youth are exposed to the finest dining experience. Externships, field trips and dining experiences are just some of the ways we partner. We actively partner with other nonprofit organizations to share resources and help youth in San Francisco find the support and path that best fits for them. Our citywide partners include City of Dreams, Young Community Developers, New Door Ventures and MYEEP to name just a few. Let us know how your organization is interested in partnering with us. A HUGE thank you to all of our partners, collaborators and volunteers.